You can set an entire Playlist to your preferred Pay-Per-View package. This will make all videos and media files within the playlist to your chosen Pay-Per-View package. 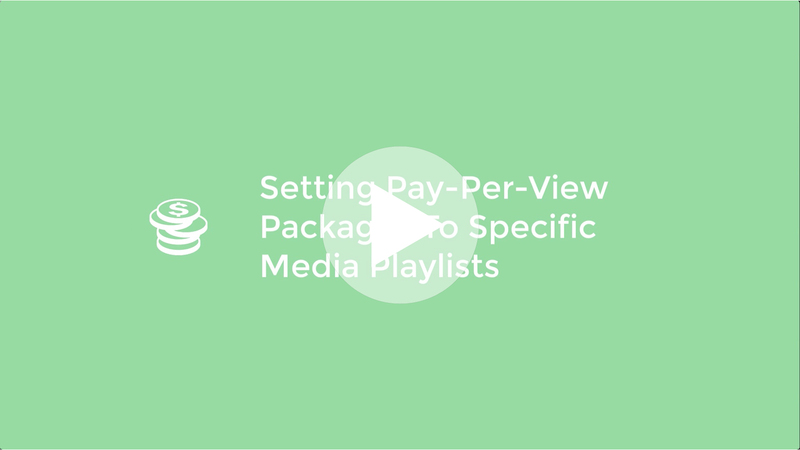 All future videos that are added to the playlist will automatically have the currently active Pay-Per-View package applied to them. If you want to check out some Pay-Per-View Demos and extra information please visit our Pay-Per-View information page. To set a Pay-Per-View Package to all videos and media files within a Playlist simply click onto the Playlist button in your Media Section. Select the Playlist you would like to change to Pay-Per-View. Under Paywall you can simply select your desired Pay-Per-View package from the drop down menu. This will open a popup information box asking you if you want to change the current default package to your newly chosen Pay-Per-View package. Select the media you wish to apply the new Package to by selecting the ☑️ Check Mark next to it. You have now applied your chosen Pay-Per-View package to your desired Playlist. When you have set your Playlist or Videos to Pay-Per-View, you will also get an option to select a Order Confirmation Email that will be sent to the buyer after making a purchase. You can use the default one or create your own ones. To learn how to create Order Confirmation Emails please checkout our tutorial.